French Lick, IN – French Lick Resort, one of golf’s leading resort destinations, celebrates a historic milestone in 2017 with the 100th birthday of The Donald Ross Course. Long considered one of the best public Ross-designed courses in the country, the pedigree and history is undeniable. This Donald Ross course has withstood the test of time. “It has truly become an iconic landmark, thanks to the vision of Bill Cook and Steve Ferguson, and we are very proud to continue maintaining its historic tradition and experience for our guests at the resort,” Dave Harner, director of golf at French Lick Resort, said. In 1901, Tom Taggart, the then mayor of Indianapolis, along with a small group of investors formed the French Lick Hotel Company and purchased the resort destination amid the Hoosier National Forest in southern Indiana. Following a series of projects, including the resort’s first golf course by Tom Bendelow, French Lick rocketed to international prominence. Taggart dreamed of hosting a national tournament, and following a series of visits to Pinehurst Resort in North Carolina where he experienced the work of Donald Ross and his masterpiece of Pinehurst No. 2, Taggart realized he needed to bring the top course designer of his generation to French Lick Resort. In 1917, he and Crawford Fairbanks purchased a piece of land about three miles from downtown French Lick and invited Ross to visit the site and create a championship layout. Most of the famous courses by Ross at the time were built for private clubs, but Taggart was set on the creation of a Ross course for his resort guests similar to Pinehurst. Ross designed a classic that remains today as one of two Donald Ross courses open to the public in the state of Indiana. In addition, it did not take long after the course was completed for French Lick Resort as Taggart coveted, to host its first major championship – the 1924 PGA Championship. The resort, with its charm and rich elegance was the perfect venue for the high society favorite and golf’s leading man, Walter Hagen, to capture his first of four consecutive championships. Later it became a popular stop for the LPGA with the 1959 and 1960 LPGA Championships being hosted and won by legends Betsy Rawls and Mickey Wright. In 1957, a young Pete Dye won the Midwest Amateur on the Ross course. It would not be his last success at French Lick Resort where he returned years later to build his own modern classic course. The Ross course has hosted many golf greats and celebrities including Gene Sarazen, Chick Evans, and Bing Crosby. Even before he became “Larry Legend,” French Lick native Larry Bird worked and played on the golf course in his youth. The property remains rich with hilly terrain and few trees offering up great panoramic views of the course. Ross took full advantage of the rolling hills finding the best routing, which was his strong suit, and took advantage of the best locations for tees and greens on the elevated spots. All of the legendary architect’s key design elements can be found on this national parkland treasure. A strong routing consisted of two loops, wide fairway corridors, strategically placed bunkers, short walks from green to tee, and a variety of green designs and contours that have remained untouched for over 100 years. From the mid-1960s until the late 90s, the Ross course fell into disrepair with maintenance cuts, bunkers being filled in to speed up play and an overall lack of attention. In 2006, following the acquisition of the resort by the Cook family, a decision was made to restore the historic Ross course to its original design. Golf course architect and Indiana native, Lee Schmidt, along with guidance from the Donald Ross Society, were called upon to handle the restoration. Old drawings and course maps were studied, which played a critical role in the $4.6 million project. More than 35 bunkers were fully restored along with new irrigation, which allowed fescue grasses to be lined along each fairway to put a premium on accuracy. Tee boxes were also restored and squared off, and a few were added to bring the course in line with modern enhancements to the game. The classic Ross green complexes, which were mostly intact from the original design, required very little attention. Similar to many Ross designs, the greens are the premier feature of the course. With their locations mostly high above the fairways and including severe pitches from back to front, they average over 6,000 square feet. As intended by Ross, the old-school surfaces require a deft touch with a putter. The restoration has proven to be a great success as evident from recognition by national golf publications and course raters, as well as the thousands of rounds being played annually. It is a significant reason the resort has become one of the leading golf destinations in America. In celebration of the Donald Ross Course 100th anniversary in 2017, a limited edition package, in which only 100 will be offered, will be available from March 15 – April 30. 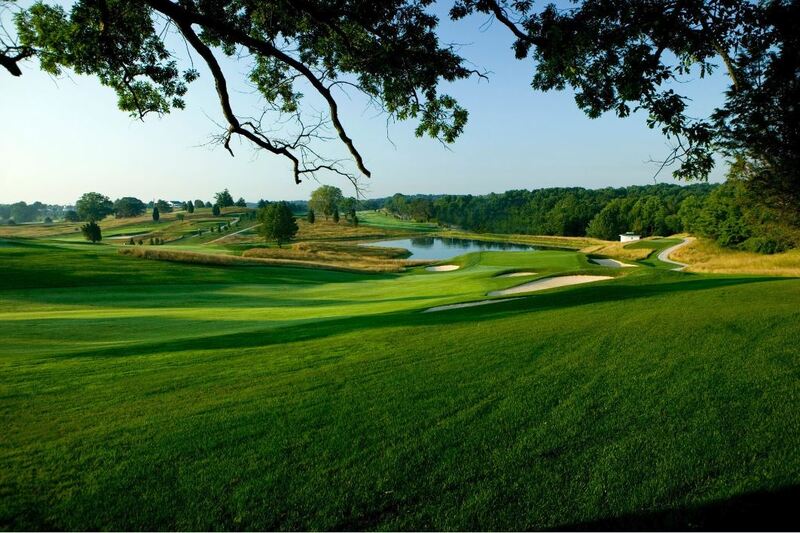 Take a step back in time and experience the history of Donald Ross at French Lick. This package includes a one-night stay at either resort hotel, two days of unlimited golf on The Donald Ross Course with cart, breakfast at Hagen’s Club House Restaurant and a LIMITED EDITION collectible gift with a retail value of $299. Package price starts at $399 per person based on double occupancy. A day of additional golf can be upgraded to The Pete Dye Course for an additional $200 per person. Visit http://www.frenchlick.com/golf/packages for more information. Many other fun and exciting things are being planned for 2017 as French Lick and the Donald Ross Course celebrate 100 years of Legendary Golf!